As the head of Capgemini’s Business Services delivery centers in the Americas, I am fortunate to work with an amazing group of people who are committed to not only delivering value for our clients, but also for the local community. 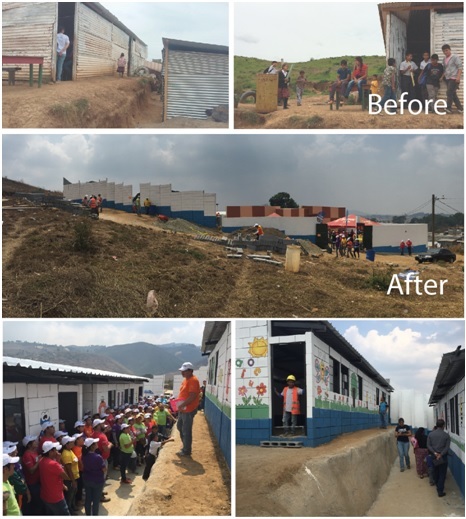 Here’s one amazing example from our Guatemala team who partnered with United Way to help build a school for the children of Bosques del Quetzal School. Bosques del Quetzal is a small town located in a poor and marginal area of the country. In 2014 it was flooded by heavy rains and the existing teaching facility, a meager, one-room classroom, was destroyed. And because Guatemala has one of the poorest adult literacy rates and lowest education investment of any Latin American country, erasing the chance for the young people of this village to learn even the basics would be devastating. Understanding the seriousness of the situation, Capgemini’s local team decided to take action. Hundreds of employees contributed a percentage of their monthly pay, which was matched by the company. Within nine months we raised the funds needed to re-build the school and were ready to put the well-considered plan into action. The volunteer construction team consisted of 334 individuals who were supervised by a professional building company that sourced the building materials. Our 1.5 hour journey to the village by bus began at 7 am and the work continued non-stop until evening. On the first day, the children of the school greeted us with “welcome” signs and a little boy handed me 150 letters written by the students telling us how grateful they were. Over the course of the weekend, volunteers were distributed in groups to work on different commissions: block transportation, construction walls, construction of the perimeter wall, painting, and installation of windows and doors. The finished concrete building had four rooms (instead of the original one) with a sturdy metal roof, and a protective perimeter wall. The combined effort of the Capgemini team was remarkable and the school now supports the academic development of more than 250 children. One of the students of Bosques Del Quetzal School said: “Thank you for helping us to build the classrooms of our school. Thank you for coming to support in this construction. We need your support to be able to have classrooms for each grade, to learn and so we can be taught without problems”. For me, it was an exceptional moment of pride to see the dedication of this team to take personal time to spend with their co-workers for the purpose of helping others. I invite you to watch the video of the 3 days we spent together to support the future of our community.